Plantscape offers a helpful design service that allows you to see what finished planting projects will look like in advance. 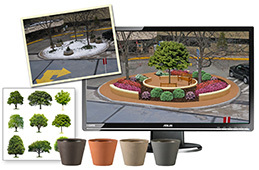 A photograph of your grounds is taken or provided, and then, using computer technology, plants and containers are superimposed onto the photo. This has proven very successful in providing our clients the opportunity to fine-tune and adjust design choices before the work is done or the order is placed. Click the thumbnails below to see “befores” and computer-generated “afters”.